America is very much the land of the rich, powerful and the free, however, as I found out during my summer road trip around California and Nevada, it is also the land of the down on their luck, poverty-stricken and the sick. There has been much discussion about America’s lack of health care and state support on Social Media and in the press of late and in California particularly, there is a huge amount of evidence of the consequences of this. In San Francisco there are large numbers of homeless, sometimes very sick people, a number of whom are evidentially suffering from mental health conditions. San Francisco Psychiatrist, Paul R Linde, explains that these people have fallen out of society, but there are so many of them that they become invisible to those who live in the city and there is little interest in providing support or help to them. To visitors however, the contrast to the sparkling shopping malls and high-class restaurants is jarring and all too real. He states that visitors “can’t help but notice both the numbers of mentally ill and the intensity of psychiatric illness on display” and this was certainly my lasting impression of what is otherwise a beautiful city. For every homeless person behaving ‘normally’ there was one talking to themselves, drooling, shouting or flailing around, demonstrating almost animalistic mannerisms and behaviours. In many respects it felt like visiting a developing country, with makeshift homes, almost shanty towns, built along the main city streets from a range of materials, including cardboard, paper, abandoned umbrellas or plastic sheeting, or for a lucky few, tents. Some of the homeless appeal to the charity of the passer-by, holding placards announcing that they have children that they need to feed, or that they’re hungry and need help. Others take a different tack, with their placards declaring “I’m being honest, I need $ for weed”. Linde explains that this is a further problem; many of those with mental illness self-medicate with drugs and alcohol. Indeed many of the homeless are there due to drug-related problems. 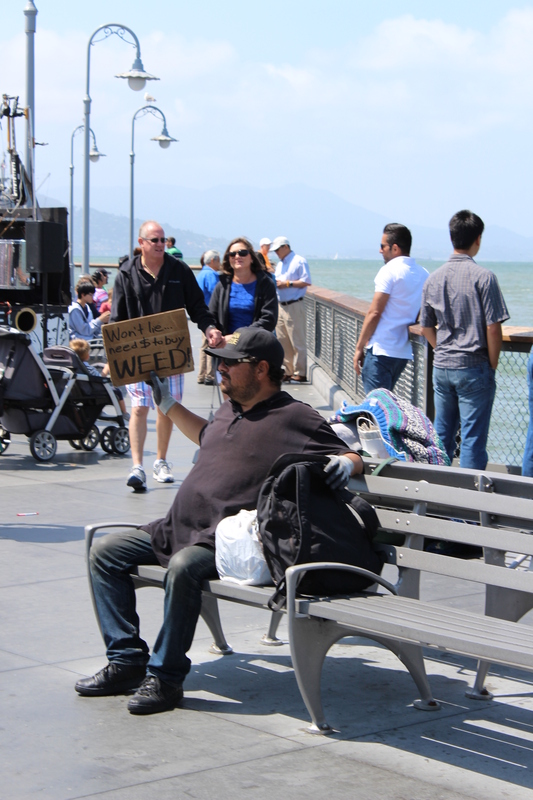 San Francisco was one of the original birthplaces of the hippy movement in the early 1960s and tour guides explain to tourists that many of the mental health conditions seen in the homeless stem from long-term drug abuse and the long-term effects of sexually transmitted diseases. Another factor appears to be the deinstitutionalisation of those in mental health facilities in the 1980s, when Governor Reagan closed down numerous state mental hospitals, leaving many of the in-patients with no choice but to live on the streets. There are also many tales of broken dreams on the streets of San Francisco. One young man in his late teens was sleeping rough, but had a guitar with him, maybe having arrived in San Francisco with dreams of becoming a successful musician and now busking for pennies. At Fisherman’s Wharf, I spoke with Jack, a web developer, who had been scammed by a Lister on Craigslist and had moved from North Carolina to work for the person who was advertising a job and accommodation at his web development company. Having paid three month’s rent and a deposit in advance, when it transpired there was no job or accommodation and the contact details were false, Jack had no choice but to live on the streets, begging for food and attempting to find work. It’s a very similar story in Venice Beach, Los Angeles, a district famous for the ‘colourful’ characters that can be found along the beach front promenade. Here I observed one man sitting on a bicycle, screaming, thrashing around and frothing at the mouth. His tirade appeared to be directed towards the rear end of an empty, stationary vehicle. A Venice Beach café owner informed me that there is a huge problem with heroin addiction in the area and a search online revealed a history of violent crime against tourists. Today there is a strong police presence, with an almost endless patrol of horse and bike-mounted police officers, patrol cars and helicopters throughout the day and night. Nevada and East California by contrast had significantly less evidence of homelessness. Although there were a few people sleeping rough in Las Vegas, they did not appear to stay for long and there was the distinct impression that they were being ‘cleaned up’ by passing police patrols or casino and hotel security. A homeless man managed to gain access to the Luxor and was begging for food in the food court, until security swiftly intercepted him and gently led him towards the doors. The general impression was that there was a problem with homelessness, but it was very much kept away from tourists so as not to distract from the glitzy facade of Las Vegas. In Laguna Beach, Orange County again there was a contrast to San Francisco and Venice. Whilst there were homeless people here, they were peaceful, didn’t bother the passing public and didn’t appear to be openly displaying signs of mental illness. The public seemed to be much more open to aiding these homeless people than I had observed in other areas and many of them had takeaway containers and drinks from local restaurants and cafes. I must say at this point that despite these observations, I thoroughly enjoyed my time in America and it has a huge amount of wonderful facets, however it is not a welfare state and that is very much evident. One of our hosts explained that he pays £400 per month for health insurance and his son and daughter-in-law pay £800 per month for them and their small child. There are huge pharmacy stores on the high street, selling a huge range of preventative supplements, symptom-suppressors and medication, which would be prescription-only in England, at a huge premium. Medication that would cost the prescription rate of £8.20 in England for three month’s supply is over $20 for one month in America. Not only is it incredibly expensive to get health care, it is not uncommon for American employees to only have an allowance of 14 days holiday per year and 5 days allowed sickness. Alex, an office worker who we met in Las Vegas explained that exceeding the sickness ‘allowance’ can lead to instant dismissal and difficulty in finding future work. This explains the extensive range of expensive medical products on sale to help mask symptoms of illness, ensuring that workers can attend work, regardless of their state of health. I get the distinct impression that whilst America can be the place to realise your dreams, it is an unsympathetic and hard country and it would be all too easy to end up down and very much out.